Merging organic, heterocyclic, and fluoroorganic chemistry, fluorinated heterocyclic compounds have distinctively desirable properties suitable for use in pharmaceuticals and agrichemicals, especially their ability to penetrate the cell membrane barrier for drug absorption. Offering a needed overview of this relatively new addition to the heterocyclic family, this essential reference provides the latest state-of-the-art information on key application areas within fluorine chemistry. 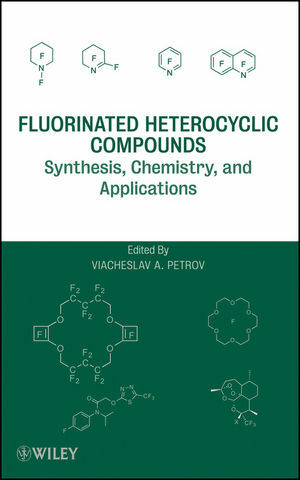 Written by a team of world-recognized experts in the area of organic and industrial chemistry of fluorine, Fluorinated Heterocyclic Compounds: Synthesis, Chemistry, and Applications will prove valuable to both students and researchers from academia and industry seeking further knowledge of the synthetic methods, chemistry, and applications of major classes of fluorinated heterocycles. Viacheslav A. Petrov is a Research Fellow with DuPont Central Research and Development in Wilmington, Delaware. INTRODUCTION: NOMENCLATURE OF POLYFLUORINATED HETEROCYCLES. PART I SYNTHESIS AND CHEMISTRY OF FLUORINATED HETEROCYCLES. 1 Fluorinated Three-Membered Ring Heterocycles (David M. Lemal and Sudharsanam Ramanathan). 2 Fluorinated Four-Membered Heterocycles (Roman B. Larichev and Viacheslav A. Petrov). 3 Fluorinated Five-Membered Nitrogen-Containing Heterocycles (Kenneth L. Kirk). 4 Fluorinated Five-Membered Heterocycles Containing Oxygen, Sulfur, Selenium, and Phosphorus (Yuriy Shermolovich). 5 Synthesis of Fluorinated Sugars from Fluorine-Containing Synthons (Xiao-Long Qiu and Feng-Ling Qing). 6 Synthesis of Ring-Fluorinated Pyridines (Anatoliy M. Shestopalov, Alexander A. Shestopalov, Lyudmila A. Rodinovskaya, and Anna V. Gromova). 7 Synthesis and Chemical Transformation of Six-Membered Aromatic Heterocycles Containing Perfluoroalkyl Groups (Viacheslav A. Petrov). 8 Perfluorinated Six-Membered Aromatic Heterocycles Containing One or More Heteroatom (Graham Sandford). 9 Perfluorinated Nonaromatic Heterocycles (Viacheslav A. Petrov). 10 Seven-Membered and Larger Ring-Fluorinated Heterocycles (Viacheslav A. Petrov). PART II APPLICATION OF FLUORINATED HETEROCYCLIC MATERIALS. 11 Agricultural Products Based on Fluorinated Heterocyclic Compounds (Wonpyo Hong). 12 Pharmaceuticals Containing Fluorinated Heterocyclic Compounds (Kenji Uneyama and Kenji Sasaki). 13 Practical Uses of Fluorinated Heterocycles (Paul R. Resnick).